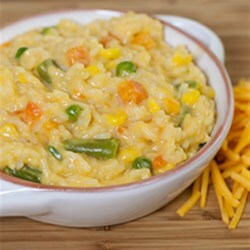 "This easy and cheesy one-pot dish gets to the table in under 15 minutes and is a great way to add more vegetables to your meal. Bonus  only one pot to clean!" Heat oil in medium sauce pan over medium-high heat. Add remaining ingredients, except for cheese. Reduce heat to low, cover and simmer for 10 minutes, or until liquid is absorbed. Add cheese and stir until melted and serve immediately. Try something new for breakfast with Blueberry Lemon Sprouted Rice and Quinoa. It was too runny, and lacked flavour. I would use less liquid and some more spices. My 1 year old scarfed this down. Quick and easy for week day lunch and way better than a box of macaroni and cheese. I love this recipe! It is quick and very adaptable. I use coconut oil and omit the salt. I add Perdue shortcuts chicken and broccoli. A great meal for my humans and my dog! I added onion and jalapeno too. Yummy. I also added garlic but it was good without as well.